Installation of Windows Small Business Server 2011, minimal hardware requirements for installation, error during installation. The SBS 2011 server must have at least 4 GB of memory. The installation partition must at least be 80 GB and recommended size is 120 GB. If the size is between 80 GB and 120 GB you get a warning but you can continue. If it does not met the criteria you cannot continue installing. If you are installing SBS 2011 as a hyper-v guest, you can turn off the server and extend the virtual hard disk via hyper-v settings. Only after that you have to attach the vhd file on your host server via disk management and also extend the volume. For more details about the installation process take a look at my multi part intallation and configuration article. Posted in Blog, SBS 2011 by ronnypot at December 19th, 2010. While it will ‘install’ in 4 gigs, the minimum for production use is 8 gigs of ram. And even 8gb is a bare minimum for production. will it be possible to install sbs2011 on a 2 Core System ? I’ll use this to develop applications. I have installed it as Hyper-V virtual machine only, but I just added one processor and as far as I know or read about it there is no hard block on processor. So I think there will be no problem. If so please let me know I will record it. Will SBS2011 run in ‘production’ fine if I’m simply using it as a two or three user Exchange server, nothing else with 4GB of RAM? What if I decrease the size to 2GB after install? Also, is exchange difficult to set up in SBS? I am a complete Windows Server newbie. Please do not do this, Microsoft recomments a minimum of 8GB ram, but this is bare bare minimum. I would never deliver a SBS 2011 production server with less than 12GB ram. If you look at the requirements of an Exchange 2010 server with all roles on one server it has a minimum requirement of 10GB ram, so this is already more then they recommend for SBS. I have a test environment with 6,5GB ram and it is not fast it is allright for test but I won’t be fine if this is the speed for a production environment. You could try with 8GB ram and look if it is fine for you otherwise put in additional memory later. About Exchange, when you setup SBS via the wizards exchange is fully operational after completion. It?s actually a nice and helpful piece of info. I?m satisfied that you shared this helpful information with us. Please stay us informed like this. Thank you for sharing. That’s exactly what the screen and boog post says. It will not continue with less than 4gb ram installed. If not mistaken, you are using SBS 2011 Standard edition. You might want to try out SBS 2011 Essential edition that have lower system requirement and the best it is no need for the CALs license with the restriction that you have no more than 25 users. The system requirement and detail for SBS 2011 Essential is in http://wp.me/p1KeqG-4q . Check his out. I am aware of SBS 2011 Essentials but this is just a warning where people may run into when they install SBS 2011 standard. SBS 2011 Essentials may have smaller processor and memory requirements, but the harddisk space requires more, minimal partition of 160GB because of the client pc backup feature included. Also SBS 2011 Essentials does not include a on premise Exchange and Sharepoint solution so this makes it a complete different product, which may be interesting for some customers, but not for all. So people using SBS 2011 standard need to deal with these requirements. And those minimum requirements are only useful if you install the server for test purposes for production you need a lot of more memory to run a stable server. 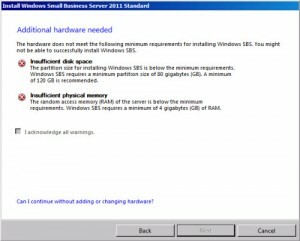 HI guys, I have an ISO of SBS 2011 I would like to install on a bare metal server. I don’t want to install VMWare or another host system. Do you guys know how I would be able to install the ISO file from a USB key or I am I to create a DVD from the ISO larger then 4.7G????? The installation never looks at my cfg file. It goes to the installation menu and I am stuck with too small of an installation drive. 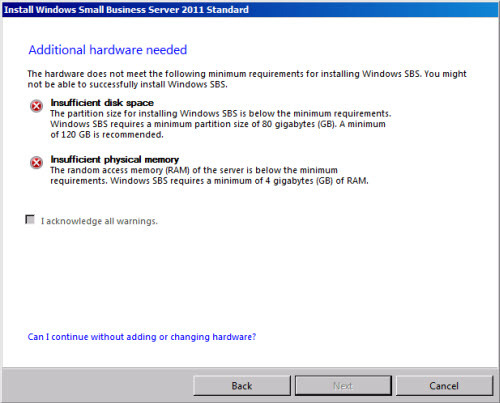 Sorry no idea, as far as I know you cannot install a SBS 2011 standard on a drive smaller than 80GB. Beside if you can you will end up in problems because a clean SBS 2011 standard installation will use about 50GB if you even move all data, databases, logfiles and so on to another partition so after some windows updates and usage the server will go over the 60GB and will stop working because there is no space left. thanks for that but this is for SBS 2008, the problem with SBS 2011 is if you install it with just 4GB (which you can do) the installation will fail, because it will run out of memory. The installation needs at least 5 or 6GB to run through the complete installation without any errors, so trying with less is useless. Thats just not true, sbs 2011 will install just fine with 4Gb and it will run through the wizards just fine, granted its slow to install and will run like a snail when done but it will install, i just hate when people who dont know what they are talking about issue statements like “the problem with SBS 2011 is if you install it with just 4GB (which you can do) the installation will fail” quite simply not true…. I would not post this if I didn’t ran into this problem. So it is right the minimum is 4GB but I had issues with the setup running out of memory when installing with this amount of memory and using 6GB it rans fine. It could be a combination of memory and other poor hardware, it is just a tip if you ran into this problem.